The Chew had a special cook-off on the show between three chefs who each spend their days feeding the hungry. Each chef was competing for the title of The Chew’s first-ever Holiday Hero. Jonathan Jernigan was one of the chefs. He works at the Cathedral Kitchen in Camden, New Jersey. He’s the executive chef culinary instructor. Cathedral Kitchen is a non-profit that’s been around for 37 years and it works to to feed the less fortunate. He also teaches culinary arts in the Second Chance program, for people trying to learn new skills coming from different areas of life, including incarceration, homelessness, veterans, and drug addiction. 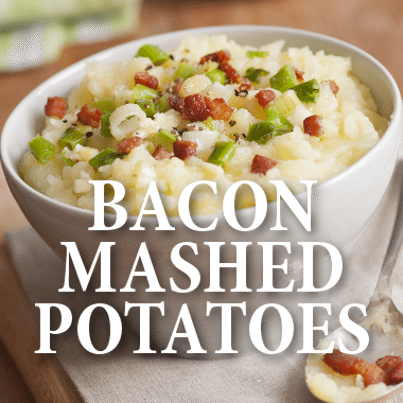 Jonathan Jernigan made this special recipe, his Mashed Potatoes with Collard Greens and Bacon recipe. It looked absolutely delicious! Check it out below! Start the recipe by steaming potatoes with their skin still on for about 30 minutes, until they’re very tender. Mash them together with butter and hot milk until all the lumps are gone and then season well with salt and pepper. Saute onions over medium heat until translucent in some olive oil, then add the collard greens and saute for 2 more minutes. Add chicken stock and cook for 5 more minutes until the liquid evaporates. Meanwhile, cook bacon in a large saute pan until the fat is rendered and bacon is crisp. Add half of the bacon, the bacon fat, and the collard greens into the mashed potatoes and stir together. This step resulted in cheering from both The Chew crew and the audience and it’s easy to see why. This is where things become ridiculously delicious! Serve potatoes with the remaining bacon pieces and scallions on top on a large serving platter.